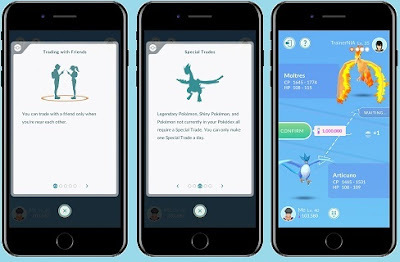 It's almost two years since launched on Android and iOS, Pokemon Go will officially release the Pokemon Trading feature, along with the new Friends System. Soon you will be able to trade Pokemon with other players in the real world. 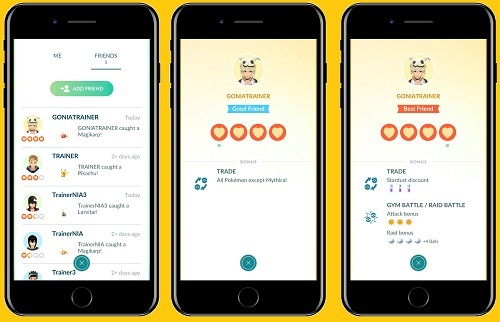 Yes exactly, this morning, Niantic announced that Friends and Trading system are coming soon, which will offer various online social features with nearby people. The friends feature will start launching to Pokemon GO this weekend, this feature allows you to connect with friends in real life and keep track of their adventures in Pokémon GO. You will be able to send items to them, get bonuses and even trade Pokemon. First, you have to ask for their Trainer Code. On the trainer's homepage, there's the "Me" and "Friends" word on the right side > tap "Add Friends" to add friends. There you can invite a Trainer to become your friend by entering their 12 digits Trainer code and then send them a request. If they accept it, you will be friends, and you can see it on your Friend List. Once you've added friends, you'll be able to reach one of four friendship levels: Good Friend, Great Friend, Ultra Friend, and Best Friend. Increase your friendship level will offer you various bonuses, including reduced stardust fee for Pokémon exchange, additional damage during a Gym or Raid battle with a friend, and additional Premiere Balls during Raids with a friend. Good Friend: You can trade all Pokemon, except Mythical (Mew). Send a gift to friends. Participate in Gym or Raid battle with them. As I mentioned above, you will also get bonuses according to your friendship level, when you play together. For example, you can get best the attack bonus to give your Pokémon an edge. when you and Ultra Friend participate in a Gym battle or Raid battle together. But keep in mind that you can increase your Friendship Levels once per day per friend. The players are on your friend list. You are within 100 meters of each other. In essence, you have to be close. You and your friends have at least a level 10 or higher. Of course, this is very unfavorable for spoofers or players who like to fly because they cannot trade with other players from long distance without any friendship ties. Trading Pokemon can give you bonuses candy for the Pokémon you trade, and the bonuses can increase if the Pokémons you trade are caught in a remote location to each other. All the trading Pokemon actions require the Stardust, and some trading requires more Stardust than others. When you build or increase your friendship levels with friends who want to trade, you can do it with a much less Stardust. Certain Pokémon, like the legendary Pokémon, Pokémon Shiny, or Pokémon that are not registered in your Pokédex, require Special Trade to be traded. You can only use the Special trade once per day with a Best Friend (for example), and often requires a lot of Stardust to complete the Special Trade. Stardust needed here is not a small amount, because it can reach hundreds of thousands and even millions of stardust for a trade Unregistered Shiny and Legendary Pokemon in your Pokedex. But as I explained above, the stardust will decrease up to 40,000 if your friendship level is higher. So, think before you trade a Pokemon. So do not think you can make a lot of money from this trading feature, because Niantic really minimizes the chances of a massive real money trading (RMT) in Pokemon Go. Another advantage of trading Pokemon, ie the CP, IV, and Pokemon traded status will be reset, resulting in a random new status for the Pokemon you receive. The possible result of CP, IV, and HP can be very large or very small depending on your friendship level, Best Friend will be much more likely to receive a stronger Pokemon. When you play a photo disc in PokéStop or Gym, you have the chance to receive a special Gift. Although you can not open the Gift you received from PokéStop, you can send it to a friend on your Friends List. There will be a bunch of useful items inside the rewards that your friend will receive along with a postcard showing you where you picked up your Gift. A special surprise can be included in the Rewards: The egg, which when hatched, will contain the Alolan, the Pokémon originally found in the Kanto region. You will need the Trainer code to add a friend. You can add maximum 200 friends on your list. There are 4 friendship levels, including Good, Great, Ultra, and Best Friend. It will take 1 days, 7 days, 30 days, and 90 days to reach the 4 levels because you can only level up once per day. There will be an attack bonus and Premiere Ball bonus for Raids. You must be in 100 meters range, and at least level 10 to be able to trade. The cost of the Stardust will be lower depending on the friendship level. All the Pokemon can be traded, except the Mythical (Mew). You can only Special trade a Pokemon once per day and per friend, and the stats of the Pokemon are changed. Special 7 KM eggs with Alolan Pokemon available in a gift.